Battletoads Double Dragon: The Ultimate Team is perhaps one of my favorite action / fighting / beat-em-ups on the Super Nintendo. 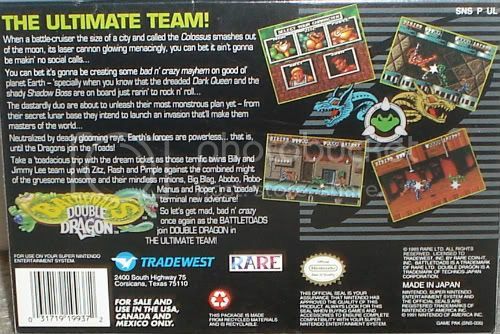 It combined the successful characters of the Battletoads games, and included the Double Dragon character’s; in addition, both of the character’s enemies were teaming-up to conquer Earth. It sounded like a comic book crossover. 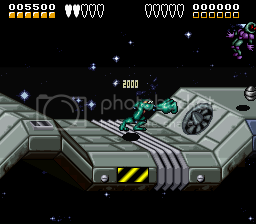 To be honest, I had only played Battletoads on the Nintendo, and loved it to death, despite it being 1 of only 2 Nintendo games I have never beaten to this day (the other being Battle Tank). As for Double Dragon, I had only played the 3rd game on the NES, and thought it was fun, despite the controls always seeming frozen when trying to jump. 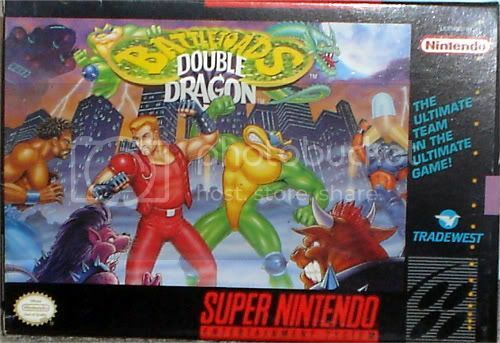 However, it didn’t matter that this was a Battletoads game with Double Dragon characters in it (the game play wasn’t exactly Double Dragon) but it was fun anyway. How? What made it a memorable game? First off, is the challenge. The game challenge is medium. They scaled down the levels and made the challenge more medium, than hard, like the games they were based on. Despite that, it is a very solid game. Every punch, kick, and super pile drive connect perfectly, and you can always time your run so that you land a giant kick on a fallen enemy to kill him instantly. I should back up to the controls. Buttons A and Y equal Jump, and B equals punch. That is all. It’s simple. It starts out in a 3 dimensional battle plane, where you can actually die instantly falling off the platforms if you aren’t careful. Luckily, you can walk climb on the edges and kill by kicking them off, or take advantage of them and stomp on their hands, killing them instantly as they fall into the space below. Aside from a very ridiculous 1st boss, the rest of the game starts to change ever so slightly once you enter the spaceship. A mini-boss tosses dynamite at you through a door, and you have to pick it up and chuck it back at him. You have to judge when the dynamite flashes to know if it’s worth grabbing or not. 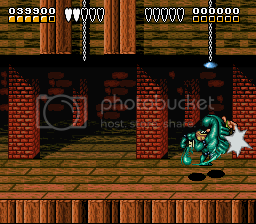 Then, you later have to go with throwing dynamite through windows for a common enemy that can be pretty frustrating in later stages if you aren’t careful, as regular enemies are fighting you at the time this is going on. You experience a speed bike race where you have to jump over barrels and fight evil bikers, you must hold onto ropes in various parts of the stages and swing vertical or horizontal, or be forced to hug a wall, leading to more variety in the stage design. Then, there is an entire level that has you controlling a spaceship in 2 different stages where one level plays like Asteroids, whereas the second looks exactly the same, but switches the controls to regular controller movement for the boss fight. 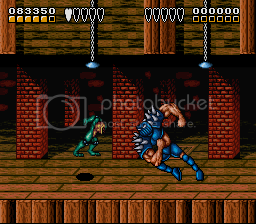 The graphics also steel the show, as the first muscle bound boss is big, but then you are surprised by Big Blag later, as he takes up a 3rd of the screen. 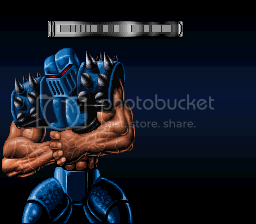 Not only is each boss freaking huge, but they all have their own attack patterns and variations, such as 2 bosses being a strictly 2D plain battle, such with Robo Manus jumping around, shooting lasers trying to squish you, while the Dark Queen hides in the ground and burns you from below, occasionally coming out to shoot fireballs, which is the only time you can damage her. The music is also really great; probably one of the more memorable soundtracks from my childhood. The music is pumping and makes you feel excited, something a game that involves walking from left to right and beating the crap out of people should let you do. The first thing you see when you turn on the screen is the intro drum beat, followed by the rock synth as the title of the game, along with a giant Battletoad and Dragon symbol, introduces you to the game; plus, the music continues into the character introduction and story behind the game. Yes, this game actually had a story. To be honest, the story serves one purpose; to allow you to punch and kick different types of people across space. The bosses goad you on when you enter the level, and you are rewarded with congratulations from Proffessor T Bird when you defeat a boss, making you feel you’ve accomplished something. Why is the story so high? It’s not the story, it’s the presentation. The opening is very well done, each cutscene has very detailed graphics when you enter a level, and the ending levels have a great victory speech for the defeat of the boss. The story itself, is this: The Dark Queen’s spaceship has shown up on radar and Professor T Bird informs the Battletoads that their arch enemy is back. The team recruit the Double Dragons for help, not knowing the Dark Queen has the Shadow Boss helping her (apparently the other ports of the game make it apparent that you know they are working together first). Can you tell which of these is the Shadow Boss, and which is the Dark Queen? 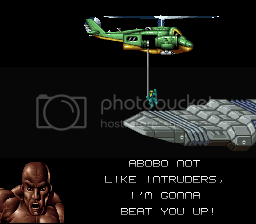 So, the Battletoads take their helicopter and fly it INTO SPACE, where they then proceed to fight IN SPACE without any oxygen or non-gravity. Who cares. It’s an action game. Pointing out trivial stuff like this is what angry losers on the internet are for. The opening of the game is a great rocking tune. The opening level is a soft, ready for adventure beat, whereas future levels has a little bit of techno mix thrown in. The Dark Queens final battle is probably my favorite tune. Yes, this game is easier than any Battletoads and Double Dragon game that came before it, but that doesn’t mean it isn’t fun. 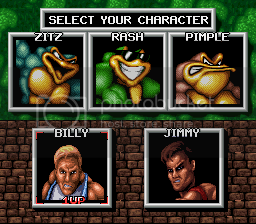 Plus, it’s two players, and you can chose the option that makes it impossible to hurt your teammate, making it a more playable two player game than the original Battletoads and Double Dragon games. I can’t not like this game. When you start the game, you will die a lot in the 3rd level on some pretty hard vine swings and other miscellaneous traps, but you will learn and adapt to them, and it won’t take that long to learn from your mistakes. 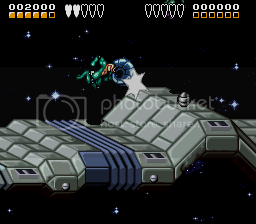 Though some people might get frustrated with the space shooter stage, I actually enjoy the little diversion. Also, this game is also fun with a friend. You and your friend should be at even skill levels, or you will drag your other friend down halfway through level 3, but it’s still fun to play regardless. The controls are simple, but simple doesn’t mean weak or lazy. They sticked with the tried-and-true formula of jump, punch, and run then kick, and then added some quick other enemy varieties like those that required dynamite be thrown through their window, enemies that could be pounded into the floor, bikers that fought you on your speedbike, space saucers and asteroids, gun torrents that need bashing from a ceiling or wall, and so on. The controls are simple, but it’s the environment and the different ways enemies are taken down that make the game feel more than it is. What else can you expect? 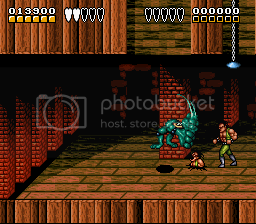 You get big, high quality pictures of all the Battletoads, Double Dragons, and their enemies at the beginning, and the boss sprites are freaking huge. The background and levels themselves are also nice to look at. I find myself going back to this game about every 2 years and playing it through until I beat it. +5: Poster. 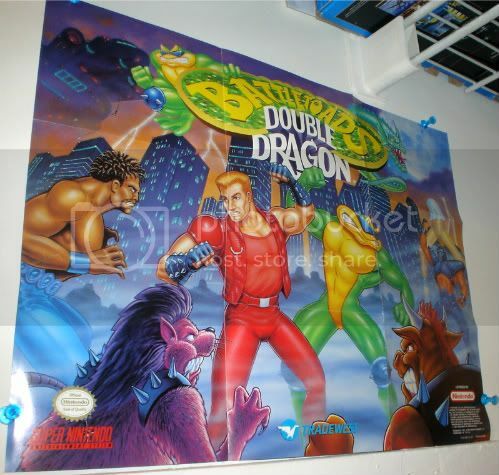 Yes, the game came with a poster. It’s actually in my closet right now. There is a Stage Select screen you can access, however, if you beat the game, Professor T. Bird will chastise you and tell you, “At least the Dark Queen doesn’t cheat.” I had, and still never have, seen a game that refuses to give you the real ending if you use cheat codes. I thought that was brilliant and wish I saw it more. Nowadays, anyone can get a trophy, and no one will know if you used some cheat code on Baby Mode to get it. +2: Fighting and breathing in space; yeah, the toads are just that awesome. +10: Nostalgic bias. No comment needed really. 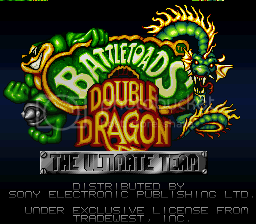 So, Battletoads / Double Dragon: The Ultimate Team, is a fun Super Nintendo action game, and it’s also fun for two players. You can play in two modes: one where you and your friend can hit each other in the game, and one where you can’t. Sometimes it’s fun to play with a friend just to see how long you can last without accidentally killing him, then having him come back for revenge until only one toad remains. Anyone who likes the Super Nintendo action / beat-em up games needs to play this game. It’s simple to learn and adapt to, and just plain fun to play, which is all a video game needs to be. wins in the collision. Video game logic triumphs again. Holy Crap! It’s A Hot Woman! This review was on the front page of RetrowareTV.